Below is basic information on bail bond laws for Arizona concerning Bail Enforcement, Bounty Hunters, Fugitive Apprehension and Bail Bondsman. This is not legal advice. Laws change frequently, please check the links provided for possible updates and current information. Arizona Revised Statutes Annotated Title 20. Insurance Chapter 2. Transaction Of Insurance Business Articles 1-3. Arizona Revised Statutes Annotated Rules Of Criminal Procedure III. Rights Of Parties Rule 7, 7.1 – 7.6. Arizona Revised Statutes Annotated Title 13. Criminal Code Chapter 38. Miscellaneous Articles 7, 12. Arizona Revised Statutes Annotated Rules of Criminal Procedure III. Rights Of Parties Rule 7. Release Rule 7.1. Definitions “Professional Bondsman” and gives requirements for such. Has not, within a period of two years, violated any provisions of these rules or any court order. The capacity to act as a professional bondsman may be revoked or withheld by the clerk or the court, for violation of any provision of this rule. Arizona Revised Statutes Annotated Title 20. Insurance Chapter 2. Transaction of Insurance Business Article 3. Agents, Brokers, Solicitors And Adjusters § 20-323.Sets for prohibitions for Bail Recovery Agents and establishes criminal records checks for such. No person who has been convicted in any jurisdiction of theft or of any felony or any conviction involving carrying or the illegal use or possession of a deadly weapon or dangerous instrument may act as a bail recovery agent. A person shall submit a full set of fingerprints to the department before acting as a bail recovery agent, and submit a new set of fingerprints on or before September 1 of every third year after initial licensure to permit the director to obtain a state and federal criminal records check pursuant to § 41- 1750 and P.L. 92-544. The fingerprint processing fee shall be an amount exceeding the cost to the department charged by the Federal Bureau of Investigation for processing. The Department of Public Safety is authorized to exchange this fingerprint data with the Federal Bureau of Investigation. The criminal investigation section of the Department of Public Safety shall provide such criminal history record information to the director pursuant to § 41-1750. Any person who acts as a bail recovery agent on behalf of any bail bond agent, and any person who conducts any action relating to a bail recovery or apprehension must be identified by the bail bond agent in the report filed with the director pursuant to § 13-3885, subsections C and D.
A bail bond agent may not employ any bail recovery agent who does not comply with the requirements of this section and who has not been identified by the bail bond agent in the report filed with the director pursuant to § 13- 3885, subsection C. A bail bond agent who is not licensed in this state shall contract with a bail bond agent in this state to retain the services of a bail recovery agent in this state. Arizona Revised Statutes Annotated Title 20. Insurance Chapter 19. Continuing Education–bail Bond Agents Article 1. General Provisions § 20-3002.Sets forth the continuing education requirements for bail bond agents. Each bail bond licensee shall biannually complete for each license period a minimum of twenty credit hours of approved bail bond insurance continuing education courses offered by an approved provider in addition to any other continuing education required by this title. As a condition of license renewal, each bail bond licensee shall complete the required credit hours applicable to each license that has been in existence for at least one year. The bail bond licensee’s name, address, social security number and license number issued by the department. The name of the approved provider. The subjects and titles of the approved continuing education courses that the bail bond licensee completed. The dates that the bail bond licensee completed the approved continuing education courses. Arizona bail agent’s arrest authority. Arizona Revised Statutes Annotated Title 13. Criminal Code Chapter 38. Miscellaneous Article 7. Arrest § 13-3885. Establishes rules for: arrest of principal by surety; prohibited conduct; violation; classification; and definitions. In surrendering a defendant, a surety may arrest the defendant before forfeiture of the bond or, by written authority attached to a certified copy of the undertaking, may empower a bail recovery agent or a bail bond agent as defined in § 20- 282.01 to arrest the defendant. Enter an occupied residential structure without the consent of the occupants who are present at the time of the entry. Conduct a bail recovery arrest or apprehension without written authorization from a bail bond agent licensed in Arizona. Wear, carry or display any uniform, badge, shield or other insignia or emblem that implies that the bail recovery agent is an employee, officer or agent of this state, a political subdivision of this state or the federal government. A bail recovery agent may display identification that indicates the agent’s status as a bail recovery agent only. Authorize or allow any third party bail recovery agent to undertake an apprehension or arrest if the bail recovery agent has been convicted in any jurisdiction of theft or of any felony or any crime involving carrying or the illegal use or possession of a deadly weapon or dangerous instrument. Violations of this section may constitute a class 5 felony depending upon subsections violated. 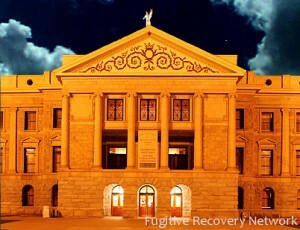 Bounty Hunters are termed “Professional Bondsmen,” “Bail Bond Agents” and “Bail Recovery Agents” in Arizona’s statutes. Rules governing such are primarily given above under #2 – Licensing Requirements for Agents. Please check with the Arizona’s Department of Insurance, Licensing Board and/or Local Law Enforcement for the most recent updates. If you know of any updates to a Arizona’s bail bond laws, please provide as much detail as possible and send to us using our contact form.